Return to the Wild West Coast! 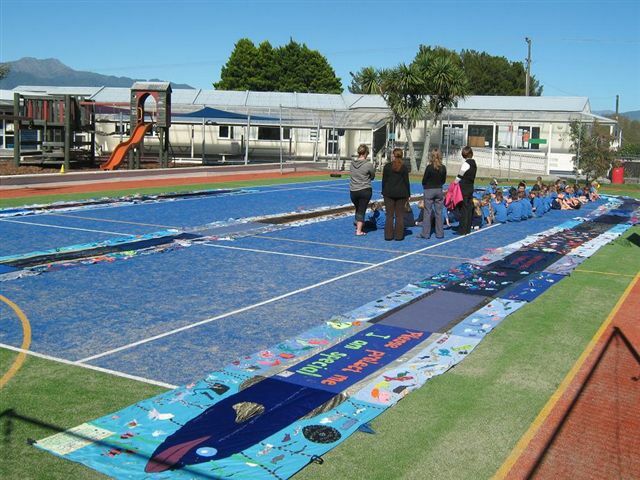 Here is 9-29March12 is Runanga’s schools newsletter with Velvet…check it out! “I then went on the Paroa school – what a welcome! The entire school got out and helped unload and lay out Velvet – one student got on the roof of the building to take a picture and couldn’t get her all in the photo! 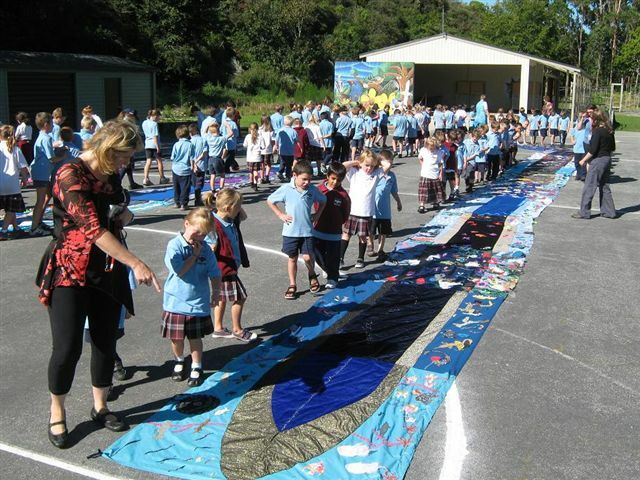 The students walked and looked with such enthusiasm around the eel and pointed out the various creatures – Jodi the teacher that helped drive the project in the end (Priscilla who began it has left), was in awe of the size and work that has gone into it…. ….The next morning, we got 20 DOC staff (the other 80 were too busy doing beach clean-ups and cutting tracks), from Buller (quite fitting for Velvet), and we held her up (well most of her) along the banks of the Hokitika River. The staff were amazed at the work and the educational value of the project. They thought the idea was wonderful and were fully supportive. We even got all 20 of them to come around and see the giant longfin eels at the National Kiwi Center afterwards – most had never been here. The newspaper got a photo and it will feature next week…. 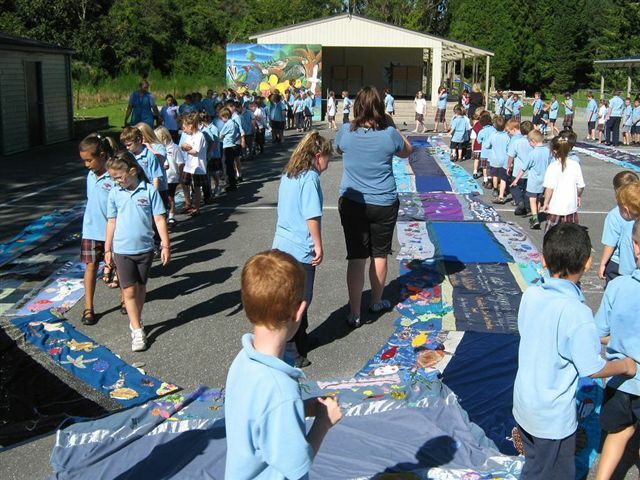 ….Finally, Sue Asplin from DOC will head with me and Velvet to Kaniere and Kokatahi schools…. Indeed, how inspiring to see that when all of us do our bit that we can make huge and amazing things happen. “Cheers” to Kim and all the wild and crazy west coasters for their enthusiasm. 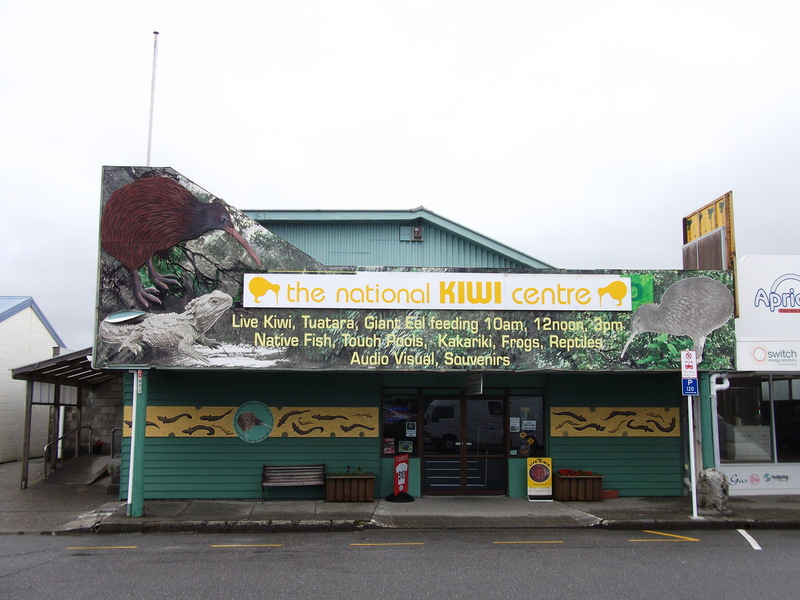 And, if it’s been a while since you visited the Kiwi Center in Hokitika, you should go. Not only can you see kiwi, tuatara, and taniwha-sized eel, but they have been working on displaying more of New Zealand’s endemic and migratory native freshwater fish! Thanks for all you do for freshwater education Kim!! !